Bird Central - Windowsill Feeder - Window Bird Feeders - window bird feeders, bay window feeders, in-house window bird feeders, cedar and maple construction - fun for the whole family, especially kids! 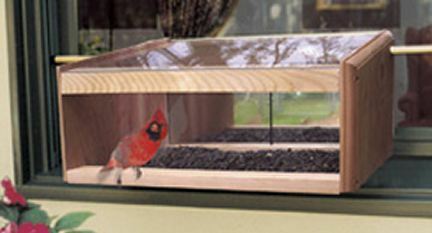 The Windowsill Feeders open back and acrylic top gives you plenty of great up close viewing of your favorite birds. Same perforated metal screen feeding platform as the Deluxe Mirrored Windowsill Feeder. Easy to use spring-set dowels let you sit the feeder on the windowsill and fit securely in the screen window tracks. Feeder is 19 inches wide and will fit in a double hung window 23 inches to 38 inches wide. Made from Western Red Cedar. Holds approximately 5 to 6 cups of seed.